In our FA cup run this season we started with Padiham who lost 5-0 at Staveley Miners Welfare in the Extra-Preliminary Round. Staveley then went out in the Preliminary Round, losing 3-1 at home against Parkgate. And so, yesterday, into the First Round Qualifying and our team was Parkgate who were drawn at home against Warrington Town. Yes, you've guessed, they lost. Our hat trick hero from the previous round was Parkgate's William Senior, and he was on the mark again yesterday, giving Parkgate a 1-0 lead in first half stoppage time. 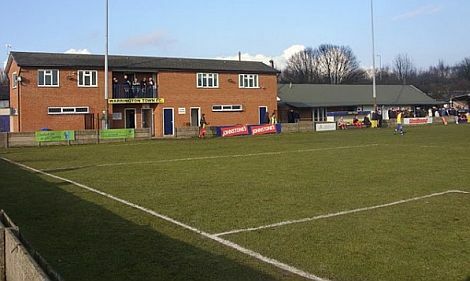 Parkgate held that lead until the 66th minute but two goals in three minutes turned the game on its head. First Chris Gahagan equalised and then Louis Corrigan put the visitors in front. It was Corrigan again, this time with a penalty in the 89th minute who gave Warrington a 3-1 win and a place in the Second Round Qualifying when they will be faced with the added hurdle of being the Clarets Mad team. There were 122 in attendance as we say goodbye to Parkgate and, for now, the teams from the Koolsport League. The biggest scorers on the day were AFC Hornchurch and Truro City who both recorded 8-2 wins against Oxhey Jets and Bridgwater Town respectively. It wasn't the best of days for our most local teams with Bacup Borough, Ramsbottom United and Rossendale United all going out. Their opponents were Bamber Bridge, Leigh Genesis and Skelmersdale United. We now await the draw for the Second Round Qualifying when the winners from the First Round Qualifying are joined by the teams from the Blue Square Bet North and South Leagues. These teams will contest the next two rounds. And we await the opponents for Warrington Town who collected a further £3,000 in prize money for this win.